Unfortunately, this class has sold out. Add yourself to the waitlist here. Learn the history and basic practices of weaving as a way to understand the binary system and its importance in computer programming. 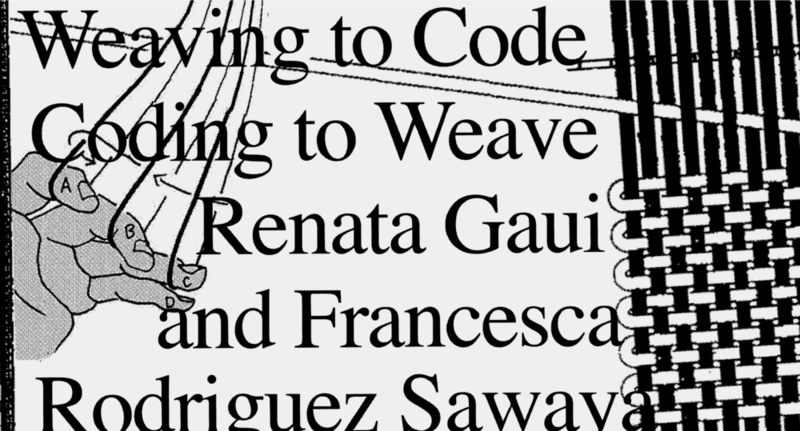 Participants will take part in weaving and coding activities throughout three sessions that intertwine the relationship between craft and digital work. Materials: A limited number of computers will be available on site; participants are invited to bring their own personal laptops. Audience: This workshop is intended for beginners with little experience coding or weaving, but it is also able to be scaled for more advanced students. Renata Gaui is a designer who has worked at creative agencies and facilitated workshops for youth both in New York and Rio de Janeiro. Most recently she’s been working with wearable technology R&D and through her artistic work she has been addressing female empowerment. She graduated from ITP/NYU. Francesca Rodriguez Sawaya is a Peruvian creator and storyteller. She believes in using compelling narratives as manifestations of sociocultural realities, using technology, audiovisual storytelling and crafting to turn those stories into tools for empowerment. She graduated from ITP/NYU.